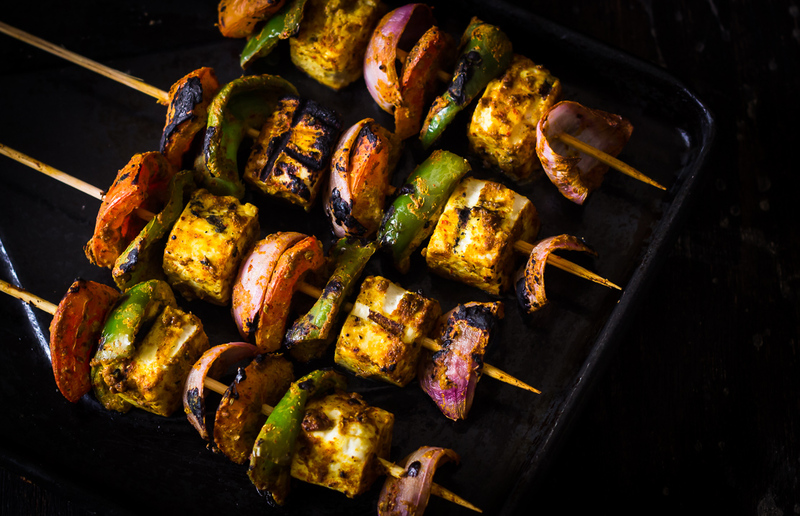 Being a North Indian, Paneer Tikka is a dish that I have grown up on and relished at most restaurants. Barring few very select ones, most consider that adding loads of chilli powder means paneer tikka. This assumption or interpretation of dish is grossly incorrect. The tikka is an amalgamation of flavour charred veggies and paneer, hint of sour curd, chaat masala, spicy yet balanced taste with right duration of marinate. Serving with coriander-mint chutney brings the perfect balance to this traditional dish. The longer you let it marinate, the better flavour it imparts. Also addition of chaat masala more than red chilli powder is important. This recipe is adapted from Dassana’s recipe. I charred the veggies separately before baking them for few minutes to give it the most authentic flavour. 1. Chop paneer, peppers, onions and tomatoes into large cubes sized pieces. 2. In a large bowl whisk the curd till smooth. Add ginger, ajwain, red chilli powder, turmeric powder, cumin seed powder, coriander powder, amchoor, garam masala, chaat masala, black pepper and salt. Mix well. The marinade is ready. 3. Now add paneer and cubed veggie pieces to this curd mixture. Allow it to marinate for at least 2 hours. Ideally it should be marinated overnight in refrigerator. 4. When ready to roast, preheat oven to 180°C. Prepare the skewer sticks, alternating between paneer, onion, pepper and tomato pieces. You can add as many as or little pieces as you like. Now brush the prepared skewer lightly with butter or ghee. Bake for 20-25 minutes. You can turn around the skewers after 10-15 minutes for even roasting. Sprinkle lemon juice and chaat masala. Serve warm with mint coriander chutney. I roasted paneer and veggies directly on flame using tongs before baking as I wanted that charred look and taste to the tikkas. You can add melted butter or ghee to the marinade if you do not want to brush it later.